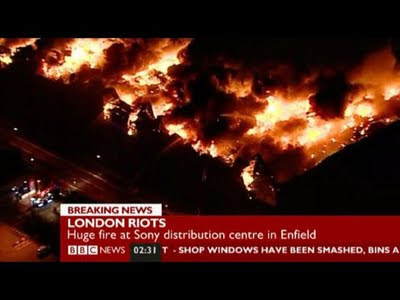 Among all the destruction and carnage left by the riots in London over the last three days, perhaps the most devastating for music lovers was the huge fire that destroyed a Sony warehouse primarily used by distribution company PIAS. The BBC are reporting that the warehouse in North London was burned to the ground this morning during the third straight night of riots in the UK. The 200,000 square-foot center housed the entire inventory of PIAS UK, the primary distribution hub for more than 150 independent labels including: XL/Beggars, Warp, Rough Trade, Domino, 4AD, Sub Pop, Secretly Canadian, Jagjaguwar, Drag City, Thrill Jockey, FatCat, Kompakt, Mute, Ninja Tune, Vice, and Soul Jazz (click here for a full list of all the effected labels). While no injuries were reported in the blaze, all the warehouse inventory is feared lost. Sadly this also includes all the stock of Little Roy's 'Nirvana reggae covers LP and CD Battle For Seattle' which was slated for an early September release. Instead, Ark Records are urging fans to pre-order a digital version of the release through iTunes in the U.K.